The V.G. in V.G. 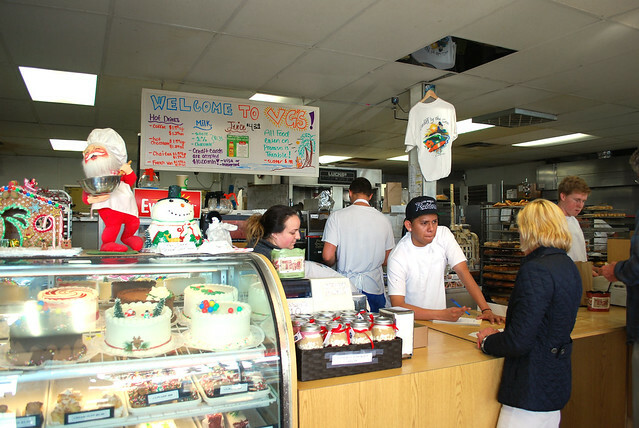 Donut & Bakery stands for “very good” and it’s an old standby located in Cardiff by the Sea. I’ve known couples who have ordered their wedding cakes from here and discovered a friend also worked here in his youth. 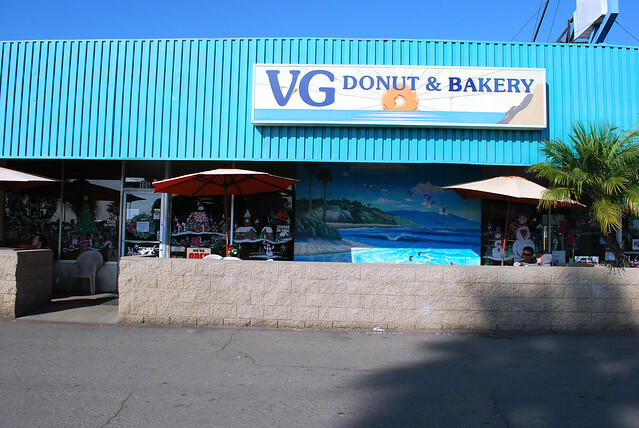 They have other baked goods like cookies, breads and of course, doughnuts. The promise of cronuts led me here one sunny day. The problem I find with cronuts and cronut-wanna be’s is the the availability. Since I live 20 minutes away from the bakery, my biggest fear is that they sellout before arriving. Luckily, one phone call secured a few for pickup at noon. It’s a nice, refreshing change from those other places where it can sell out before you arrive. 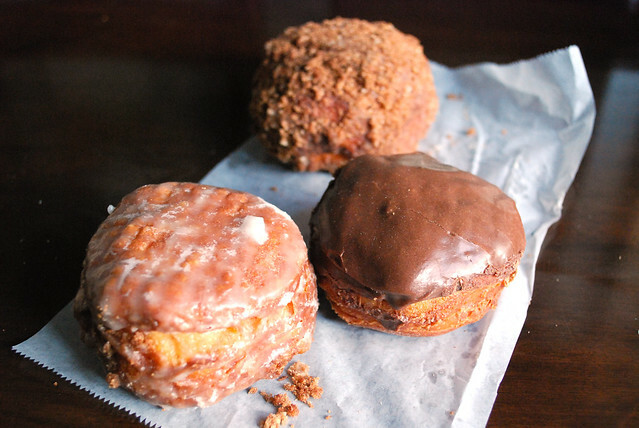 There three varieties are available at $1.99 each: cinnamon crumb, glazed and chocolate. What immediately struck me what that there was no hole in the middle. Further, a slice into the donut showed no filling; the flavor was determined by what was on the outside. A cutaway also reveals layers but very subtle and not at all flaky. I enjoyed the doughnuts as much I appreciate any other pastry (my favorite was the plain glazed) but under the cronut name, they were disappointing and far different than what I expected. 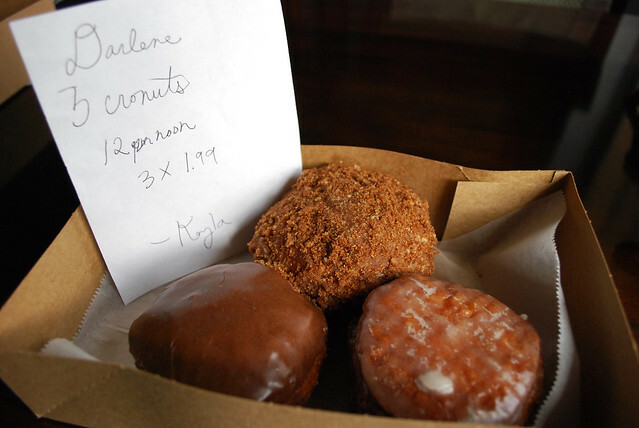 V.G.’s offers their version of cronuts on the weekend but call ahead to confirm and reserve a few. 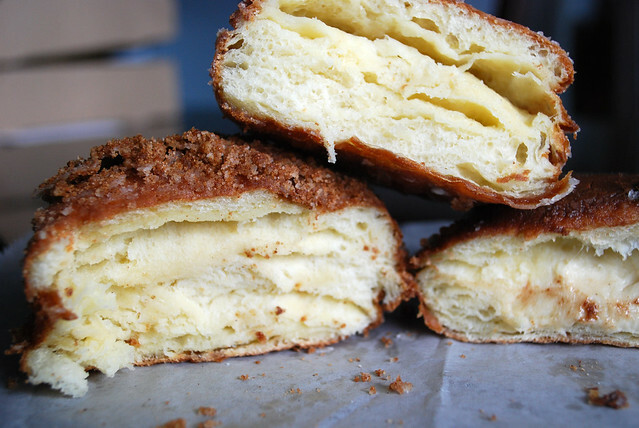 Related: San Diego’s Cronut Contender: Azucar’s Cray-Nut, Paris Baguette’s Croissant Donut, Peterson’s Cronut, K Sandwiches’ Glazed Croissants and Whole Foods Del Mar Croissant Doughnuts. OH MAN I LOVE THESE!!! We had some up in LA at Crumbs Bake Shop over Christmas break and I just about died they were so amazing!!! I’ll try to check out Crumbs next time I’m in L.A. 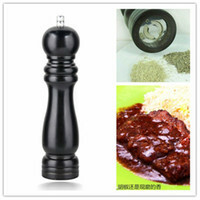 Sounds delicious! That’s nice they have 3 versions of the cronuts. I didn’t know VG stood for very good! I’ve only tried one cronut (which wasn’t very good) so I’m still looking for the good one here in SD. Glad VG was able to reserve a few for you! Hopefully we can each find a good one soon. At first glance they look like regular donuts. The crumb one sounds the most interesting to me, but that’s because I love crumb donuts. Nice to see a little variety in flavors, but too bad it was only on top. The crumb donuts were good with a nice amount of cinnamon but messsssyy!